On March 11th in 2011, a huge earthquake and tsunami struck Japan and had many victims. In addition, the earthquake and tsunami caused a severe accident of the Fukushima first and second nuclear power plants (NPPs). The impacts and damages of these triple disasters, so called “Higashi-Nihon-Daishinsai” or “3.11” have continued. Keeping in mind a variety of continued issues, we should start to consider problems of social structure behind 3.11 from various viewpoints. Huge amounts of information and discourses concerning 3.11 have persisted, and it seems that confusion in understanding ecological information after 3.11 has developed. Such a development process of vulnerability can be seen in past Japanese cases. One of the most obvious examples is the Hanshin-Awaji earthquake that occurred in 1995. Exploring statistics regarding the Hanshin-Awaji earthquake, we find that the death ratio of the public registered five times more than the average of the Hyogo prefecture. For approximately 70% of people who moved to temporary houses, the average annual income was under three million yen (震災復興調査研究委員会, 1997; いのうえせつこ, 2008; 吉井, 2007). Facts seen in the past case imply that impact and hazard are more significant for the vulnerable: the poor, the elderly, the disadvantaged, etc. It also shows the gap of risk according to social stratum. When we think about 3.11, we should not avoid discussion regarding gap of hazard and vulnerability. These issues share roots with underlying problems of Japanese society. In addition to the terrible natural disasters, we also faced the severe accident of NPPs. In “Risk Society,” Urlich Beck (1986) discussed the globalization of risk and inequality on the distribution of risk and benefit. Such discussions regarding risk society point out a collision of risk receiver and benefit receiver as well as risk gap according to social stratum and area. Generally speaking, the weak of society tend to be become risk receivers. Considering these points, it seems that we repeatedly have to face questions: “What kind of people and communities receive risk and damage?” and “What kind of gaps and vulnerabilities exist in the hazard?” So, in this paper, we would like to progress our work with these ideas. Grasping the distribution of hazard, social, and economic situations of the damaged area and social structural problems as a result of 3.11. To reveal information ecosystem of 3.11 in Japanese legacy/social media through quantitative analysis of a large amount of information and discourses regarding 3.11. In our research, we basically took a quantitative approach. First, we collected and analyzed statistical data issued by the local and national governments to sketch the gap of damage and social conditions of damaged areas. 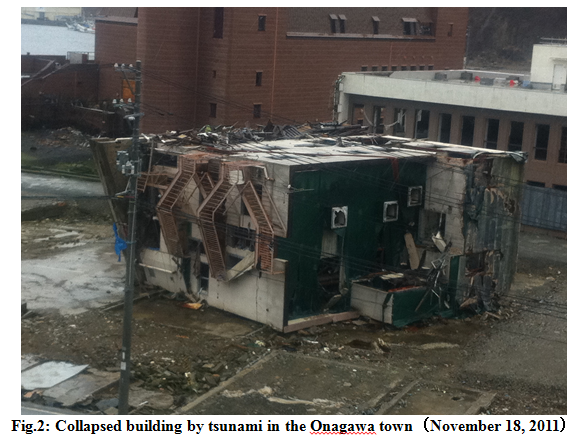 In this analysis, we focused on the 37 coastal municipalities, which were hit by the tsunami. Since March 11th, there has been a huge amount of information, and discourses related to 3.11 have been rampant. Thus, second, we conducted quantitative analysis of discourses regarding 3.11 in legacy and social media. We conducted frequency analysis, network analysis focusing on the co-occurrence of keywords (co-word), and content analysis (Freeman 1979; Callon et al., 1983; Salton & McGill, 1983; Jones & Fornus, 1987; Mullins et al., 1988; Kamada & Kawai, 1989; Braam et al., 1991; Callon et al., 1991; Leydesdorff, 1997; Batageli & Mrvar, 1998; Stegman & Grohmann, 2003; Leydesdorff & Hellstein, 2005; 2006). We also tried to grasp and compare the time-lined change of dominant topics and content diversity index (VDI) (Voakes et al., 1996), which is similar to the index of ecological diversity, between different media, such as newspaper, Web news, blogs, and Twitter. To begin, we would like to sketch the breakdown of 3.11 impacts. The earthquake, tsunami, and NPP accident broadly impacted humans, houses, the economy, local community, agriculture, and so on. There were over 16,000 deaths and 340 thousand evacuees. 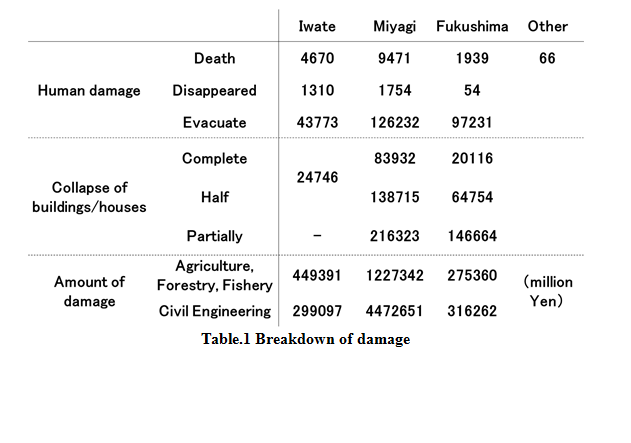 Particularly, three prefectures – Miyagi, Iwate, and Fukushima – were most affected (for example, deaths in the Miyagi prefecture reached over 9,000). We summarize the number of victims, focusing on these three prefectures, in Table 1. We also present pictures of devastated area (Fig. 1 and Fig. 2). The tsunami wiped out the coastline of towns for several hundred kilometers. Concerning causes of death, over 90% were drowning, and about 65% of the victims were over aged over 60 years (Cabinet Office, 2011). In addition, evacuation zones were set for the NPP accident, and a lot of people were forced to leave their towns (particularly in the Futaba-area). 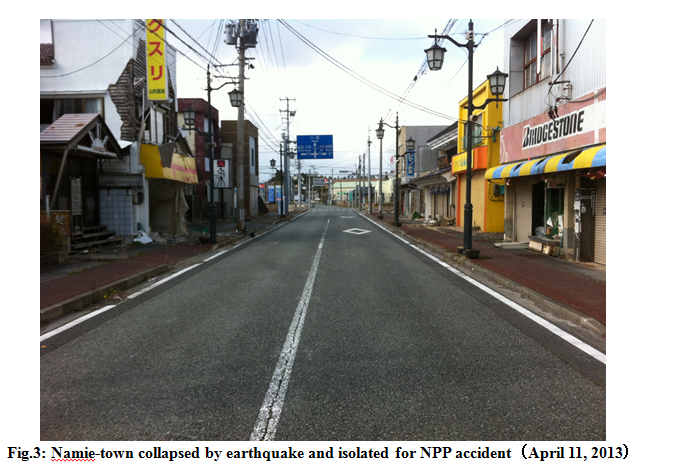 Fig.3 and 4 show the current situation of the Namie-town which were set as isolated area for NPP accident (and recently short-time stay become available) There were differences in damage and effects among the damaged regions. Looking at the press release by the national government on June 24th in 2011, it was estimated that total losses for the building, life-line, social infrastructure, agriculture, and others reached approximately 16.9 trillion yen. Over 25 million tons of rubble and general waste were generated. Of course, there continue to be other serious problems, such as the stress of disaster victim, discrimination, etc. Generally speaking, most seriously damaged areas in 3.11 have a character of aging and primary industrial society. In addition to gap of damages, we need to look at another gap; “information gap”. In our opinion, this is an one of the most significant features of the 3.11. In this paper, we infuse two meanings with “information gaps”. One is the “gap of information environment”. Another is the “gap of information which is focused and taken up by and in media”, in other words, the “gap of interests in the public sphere”. Concerning the “gap of information environment”, the report on the current status of Japanese internet usage published by the Ministry of Internal Affairs and Communications (SOUMU) tell us important situation: gap of internet use among people (SOUMU 2011). The report showed three significant points on this matter. There are gap of coefficient use of internet according to areas. The Tohoku region hasa low score compared to other metropolitan area. Considering the social conditions of damaged areas, this implied the possibilities that victims of the 3.11 had a risk to be the information vulnerable and the majority of internet users regarding the 3.11 were in the metropolitan area. For the gap of information environment, victims could not collect and transmit effectively, comparing majorities of information society. It seems that this “gap of information environment” is one of the background factors for the gap of “information which is focused and taken up by and in media”. We would like to discuss another gap: “gap of information which is focused and taken up by and in media”. 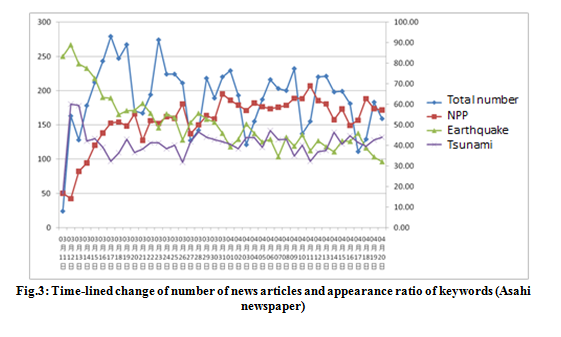 Fig.3 shows the time-lined change of article number and appearance ratio of keywords of Asahi newspaper, which is one of the most prestige newspapers in Japan. Looking at this line-chart, it is found that the oscillation cycle of article number and the change of trend in keyword appearance. The appearance ratio of “Earthquake” gradually decreased, on the other hand, the ratio of “NPP” increased. Fig.4 and Fig.5 show the co-word network, focusing on the top 400 frequent keywords in each term. Fig.4 describes of co-word network from 3.11 to 3.17 (first week after the 3.11), and Fig.5 describes of co-word network from 4.15 to 4.20 (sixth week after the 3.11). Clearly, we can find the difference of network structure among two co-word networks. This means the degree of organization of topics. Co-word network of the first week show the confusion of topics and agendas in the aftermath. Organization of topics and agendas progressed according to time (see Fig.5). Furthermore, we can extract more implications from these co-word networks. 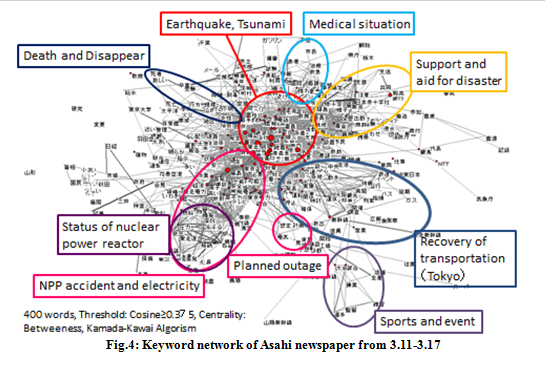 The keyword cluster meaning “Earthquake and Tsunami” has a dese network with keyword cluster meaning “NPP accident and electricity”. 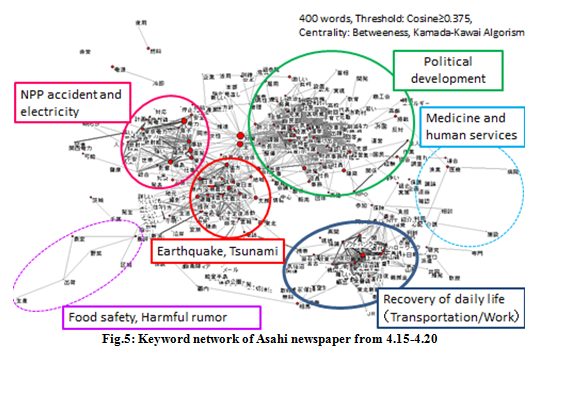 This means that the topics on “Earthquake and Tsunami” and topics on “NPP accident and electricity” were often connected in articles. This trend is seen in all co-word networks of each week. In addition, we conducted content analysis and classified news content and arguments. After that, we calculated the Speaman’s Rank Correlation Coefficient (SPCC). This result shows in Fig.6. The highly correlation between newspapers was found, it means that there were resonance of trend in taken topics. 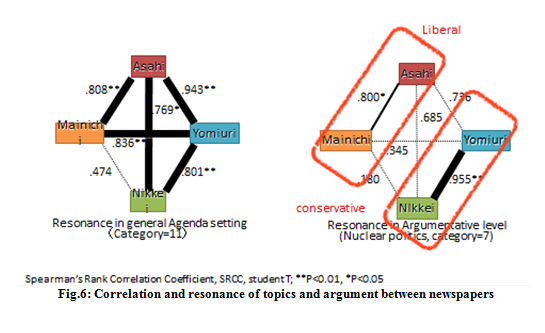 Concerning argumentation level, it is found that there are resonance between liberal pole (Asahi newspaper and Mainichi Newspaper) and conservative pole (Yomiuri Newspaper and Nikkei). Fig.7 shows a time-lined change of contents uploaded in blog entries. As the result, the contents on “Earthquake” and “Tsunami” rapidly decreased. After the decrease of “Earthquake” and “Tsunami”, “Radiation exposure” and “NPP accident” rapidly increased, however, interests on them were not sustained. In summary, interests on disasters and NPP accident have rapidly faded out. The remained and stable interests were about “low radiation exposure” and “internal exposure”. Also in Twitter, the rapid decrease of interest on NPP was found (Fig.8). In the analysis of Twitter, we categorized variety of topics as “NPP” such as “NPP accident”, “Nuclear power policy”, etc. 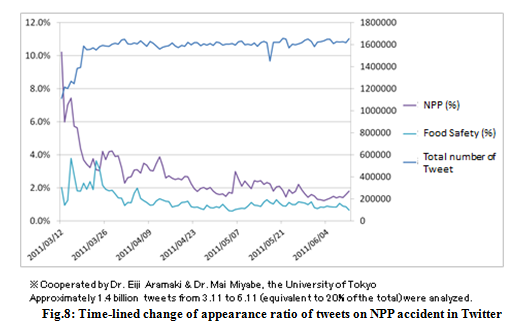 In the aftermath of NPP accident, tweets regarding “NPP” occupied over 10% to all tweets, however, by the three month after, the coverage decreased fewer than 2%. Shortly, in the internet sphere, it seems that the rapid decrease of interest concerning the 3.11 occurred. 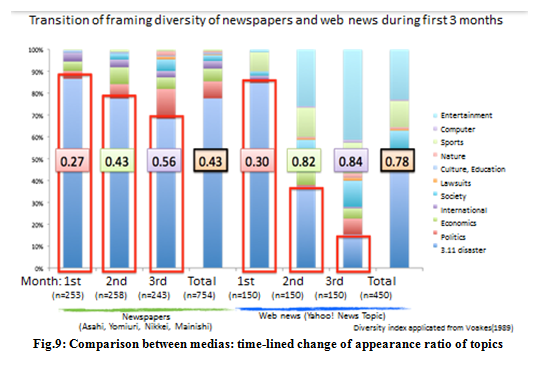 Fig.9 shows the comparison of trend of topics between newspaper and web news. Comparing to newspaper, web news showed the rapid decrease of topics on the 3.11, on the other hand, there are simultaneous increase of topics regarding “Entertainment”, “Sports”, “Economics”, and so on. Although this shift of center topics is common to each media, difference of degree between media is found. This result can be interpreted as that newspaper continued to take up the 3.11 more actively than web new and underpinned the public interests on the 3.11. However, as discussed above, we should not miss that the topics on the 3.11 in newspaper has also been dominated by topics regarding “NPP”, and topics regarding “Earthquake and Tsunami” were covered over with them. In summary, our analysis indicated that the “NPP” accident played a strong agenda setting topics and engulfed interests on “Earthquake and Tsunami”. At the same time, the rapid back to daily life occurred. In this paper, we pointed out that there are varieties of gaps on damage, social conditions, and information. In the context of the 3.11, it is expected that victims of the 3.11 tended to be information vulnerable who have difficulties to collect and remark information effectively. According to this gaps, there are “gap of information which is focused and taken up by and in media”. Our analysis indicated that “NPP” accident played strong agenda setting and covered over the “Earthquake and Tsunami”. And it is also shown that the interests for the 3.11 rapidly decreased in the media sphere. And it is expected that these gaps strengthen of gaps and cause other problems such as gap of reconstruction, gap of distribution of social resource and the public interests. When we consider the gap and inequality regarding the 3.11, conceptual tools such as “disaster capitalism” (Klein 2007) and “politics of artifact” (Winner 1986) will give us the lessons and standpoint for future discussions. In Shock Doctrine: The Rise of Disaster Capitalism published in 2007, Naomi Klein criticized that the power works for radical change of political and economic system in the emergency time of disaster with the term “shock doctrine” and “disaster capitalism”, looking at the example of 9.11, Iraq war, hurricane Katrina, tsunami of Sumatra, and so on. She pointed out the gap structure are spread, reinforced, and reproduced in the course of work of “shock doctrine” and “disaster capitalism”. In Do Artifacts Have Politics?, Langdon Winner discuss the politics which urban design have, focusing on an example of overpasses the Long island (Winner 1986). Overpasses mentioned by Winner were intentionally built by Robert Moses, who had a social class bias and racial prejudice. Thus, the overpasses were designed according to specifications that would discourage the presence of buses. This design intended to separate “upper” and “confortable middle” class from poor people and blacks. This is mere one example of the politics of urban design. However, considering the “disaster capitalism” suggested by Naomi Klein, Winner’s discussions will give us valuable lessons for perspective to politics of city plan as specific kind of artifact: “reconstruction” and “land readjustment”. The urban design for “reconstruction” seems to have good chemistry with radical change of economic and political system conducted by power holders, under the condition of the disaster shock. And this social and political structure cause new gap development, interacting with gap of damage and previous economic strength. At least, we should try to watch the gap of damage, economic status, and future movement, considering the previous lessons. For example, the Nagata-case in the Hanshin-Awaji earthquake in 1995 tells us a lot of lessons (e.g. 岩崎et al. 1999; 田中& 塩崎 2008). Beck Ulrich. 1986 . Risikogesellschaft – Auf dem Weg in eine andere Moderne: Surkamp Verlag. Batagelj, V., Mrvar., A. 1998. Pajek — A program for large network analysis. Connections, 21(2), 47-57. Braam, R. R., Moed, H. F., & van Raan A. F. J. 1991. Mapping of science by combined co-citation and word analysis. I. Structural Aspects. Journal of the American Society for Information Science, 42(4), 233–251. Callon, M., J.-P. Courtial, W. A. Turner, S. Bauin. 1983. From translations to problematic networks: An introduction to co-word analysis. Social Science Information, 22, 191-235. Callon, M., J.-P. Courtial, F. Laville. 1991. Co-word analysis as a tool for describing the network of interactions between basic and technological research: The case of polymer chemistry. Scientometrics, 22(1), 155-205. Downs, A. 1972. Up and Down with ecology: The Issue Attention Cycle, The Public Interest 28: 38-51. Freeman, L.C. 1979. Centrality in social networks conceptual clarification. Social Networks, 1(3), 215-239. Kamada, T., Kawai, S. 1989. An algorithm for drawing general undirected graphs. Information Processing Letters, 31(1), 7-15. Langdon Winner. 1986. The Whale and the Reactor: A Search for Limits in an Age of High Technology: University of Chicago Press. Leydesdorff, L. 1997. Why words and co-words cannot map the development of the sciences. Journal of the American Society for Information Science, 48(5), 418-427. Leydesdorff, L., I. Hellsten. 2005. Metaphors and diaphors in science communication: Mapping the case of ‘stem-cell research’. Science Communication, 27(1), 64-99. Leydesdorff, L., I. Hellsten. 2006. Measuring the meaning of words in contexts: An automated analysis of controversies about ‘Monarch butterflies,’‘Frankenfoods,’ and ‘stem cells’. Scientometrics, 67(2), 231-258. MacCombs, Maxwell E., Shaw, D. L. 1972. The Agenda-Setting Function of Mass Media. Public Opinion Quarterly 36(2): 176-187. Mullins, N., Snizek, W., & Oehler, K. 1988. The structural analysis of scientific paper. In A. F. J Van Raan (Ed. ), Handbook of Quantitative Studies of Science & Technology (pp. 85–101). Amsterdam: Elsevier Science Publishers. Naomi Klein. 2007. The Shock Doctrine: The Rise of Disaster Capitalism: Metropolitan Books. Salton, G., M. J. Mcgill. 1983. Introduction to modern information retrieval. Auckland, etc., McGraw-Hill. Scheufele, Dietram, A. 1999. Framing as a Theory of Media Effects’, International Communication Association 49: 103-22. Stegmann, J., Grohmann, G. 2003. Hypothesis generation guided by co-word clustering. Scientometrics, 56(1), 111-135. Voakes, Paul S., Kapfer, Jack., Kurpius, David., and Shano-yeon Chern, David. 1996. Diversity in the news: A conceptual and methodological framework, Journalism and Mass Communication Quarterly 73 (Autumn): 582-593. Wisner Ben, Blaikie Piers, Cannon Terry, Davis Ian. 2003. At Risk: Natural Hazards, People’s Vulnerability and Disasters (Second Edition) :Routledge. 岩崎信彦, 伊藤亜都子, 大原径子, 徳田剛. 1999. “激甚被災地における住宅再建の現状と課題: 阪神大震災4年目の復興区画整理事業: 鷹取東地区の事例.” 神戸大学都市安全研究センター研究報告 3:313－22. 浦野正樹. 2007. “災害社会学の岐路－災害対応の合理的制御と地域の脆弱性の軽減.” Pp. 35-41 in 災害社会学入門, edited by 大矢根淳・浦野正樹・田中淳・吉井博明 :弘文堂. 塚原東吾. 2011. “災害資本主義の発動‐二度破壊された神戸から何を学ぶのか？.” 現代思想 39(7):202-11. 田中正人, 塩崎賢明. 2008. “用途混在地区の復興区画整理事業における転出実態とその背景‐神戸市御菅西地区におけるケーススタディ.” 日本建築学会計画系論文集 73(629):1529-36. 田中幹人, 標葉隆馬, 丸山紀一朗. 2012. 「災害弱者と情報弱者: ３・１１後、何が見過ごされたのか」：筑摩書房. 吉井博明. 2007. “災害への社会的対応の歴史.” Pp. 57-66 in 災害社会学入門, edited by 大矢根淳・浦野正樹・田中淳・吉井博明: 弘文堂. Ryuma Shineha is Assistant Professor at the Graduate University for Advanced Studies. Mikihito Tanaka is Associate Professor at Waseda University. They have studied the media discourses regarding life-science, science journalism, and science & technology policy. They have worked on the 3.11 issues, focusing on the social structure, media discourses, and the public interests in this matter. Their current works on the 3.11 is published as the two Japanese books, ”The Disaster Vulnerable and the Information Vulnerable: What was overlooked after the 3.11? 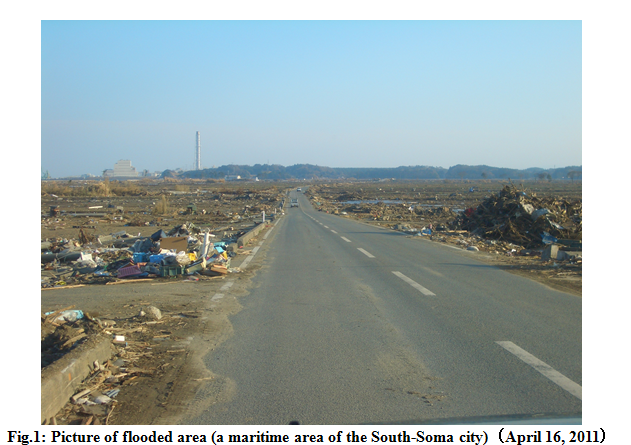 (災害弱者と情報弱者: ３・１１後、何が見過ごされたのか)” (Chikuma-Press) and “Science and Politics after the Disaster of March 11 in Japan (ポスト3.11の科学と政治)” (Nakanishiya Press) edited by Masaki Nakamura. This is a very interesting analysis of the way in which information flowed in the aftermath of 3.11, and the keywords that dominated the discussion. Your analysis of keywords brings to mind the issue of how disasters come to an end. 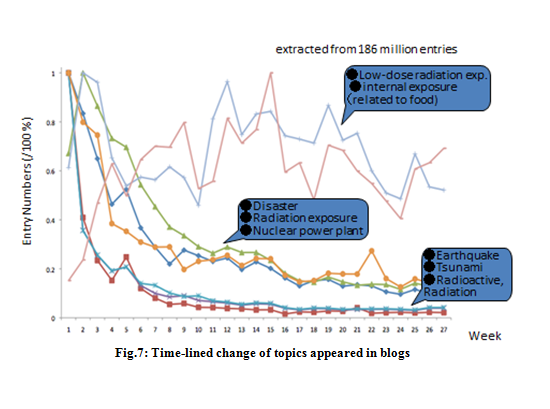 I think it would be interesting to theorize how/why it is that earthquake and tsunami references dropped off rather quickly, whereas radiation exposure persisted for much longer as a topic of discussion. Venturing a guess, I wonder if there’s something about the unsettled science of low-radiation exposure that allowed the conversation to carry on much longer, whereas a tsunami is understood to be a one-off catastrophic event, whose destruction is thought to be more self-evident (though of course the damage of tsunami to communities can be much more pervasive than initially perceived). Oliver-Smith and Susana Hoffman have written about the use of “vulnerability” as an analytical tool for thinking about disasters. It sounds like it could complement the discussion in the first third of the paper. This is a major data collection and analysis effort and the authors are to be congratulated for taking on such a gargantuan task. I look forward to further analysis that analyzes the three gaps within these communities – how does socioeconomic status effect impacted residents’ access to information? I would reiterate Scott’s comment: I think it would be really interesting to think about the connections between the three gaps, and how they might be co-constituted. I think focusing on the impacts on the elderly as a vulnerable population is particularly interesting, and will become increasingly salient as aging populations come to dominate (demographically) countries like the China and US. I enjoyed this analysis – based on a tremendous amount of data! – and wondered if the authors would link it into ongoing debates about “freedom of the press” in Japan. A number of scholars, including Ivan Hall, have discussed the issues of kisha clubs, cartels of the mind, and a lack of independence among the four major newspapers studied here (Asahi, Mainichi, Nikkei, etc.). It would be great to see how these findings confirm or move away from these past studies! On the information gap at the time of disaster, what about keitai/mobile phone usage rates, since these also provide an important way to collect and transmit information along with the internet? (Maybe older poorer people are not using them as much and don’t have the best phones, but anyway…) Larissa Hjorth and Kyoung-hwa Yonnie Kim have a paper on this topic, “Good Grief: The Role of Social Mobile Media in the 3.11 Earthquake Disaster in Japan.” Also Vincanne Adams has just published an important ethnography of disaster capitalism in action, Markets of Sorrow, Labors of Faith: New Orleans in the Wake of Katrina, which really shows how it reinforces and profits from inequalities. I was glad to see your inclusion of the “information gap” in terms of the inequalities in the distribution of risk and benefits, as it is becoming an important factor in disaster risk. You ground this with statistics of Internet use, which show a relationship between age, income and region. However, I think this can be extended beyond physical access or use into another divide between skilled and unskilled users; of those who can access the breadth of information on the net and make informed decision based on multiple sources, and those who simply depend on the most easily found information. Education may become another factor. Thank you for this analysis–I, too, can see that it must have been a very large undertaking. The discussion of the trajectory of discussion is very important, in part because the shift in attention to the strictly nuclear has the potential to shift resources away from more immediate but less “exciting” issues of recovery and rebuilding. In the immediate aftermath of 3-11 there was significant discussion of the likely problems in recovery due to a lack of many lines connecting individuals to various information/resource networks, conclusions based on survival recovery after the Awaji/Kobe quake. In urban environments, where individuals are not tightly linked in neighborhood organizations and there is a relatively high degree of social autonomy (one reason rural people move to urban areas is to escape tight rural village atmosphere), the ability to connect to others by multiple means clearly is valuable. That does not mean, however, that people in other kinds of communities, particularly more stable, albeit rustic communities, lack some functional equivalent of an urban center’s multiple lines of communication. In rural or older urban wards and blocks, the “thickness” of connections provides a reasonable substitute in at least some circumstances — news sharing, resource sharing (think of images on our TV of Tohoku storekeepers giving away their stock to help their neighbors). A critical question for future evaluation and assessment of potential for resilient response to large-scale human tragedies: what avenues of communication and mutual aid did people rely on in the immediate aftermath of the tsunami? What worked for people when the standard technologies on which they relied were rendered useless? What, if any, local provisions made re-establishment of more standard communications possible, even before the arrival of outside assistance? 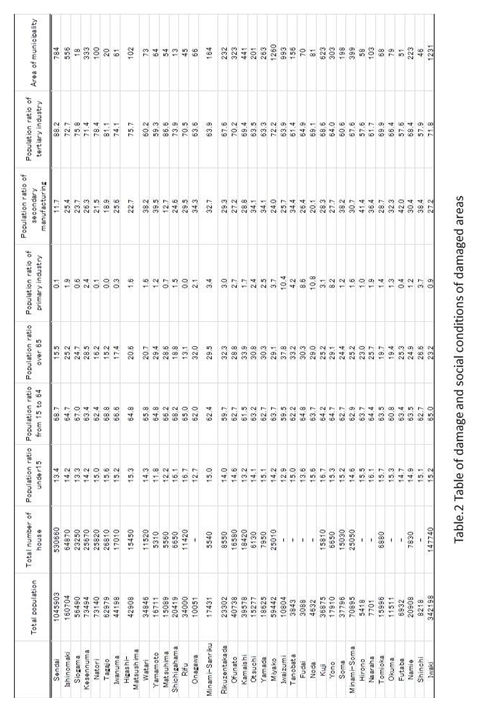 Table.1 and 2 is based on the data published by 24/2/2012. Thank you for this insightful research. When talking about politic of the artifact, I agree it is important to look at the connections that work (the bridges) and the connections that don’t: the gaps. I also like how the same concept is translated in different contexts, material and immaterial. Your work also provides a very interesting insight on the both the construction of vulnerability in broad sense by experts, media, and residents. Experts of disasters preparedness have been complaining for long time about the lack of interest of population and communities’ leaders and the small window of opportunity that that have to make visible their claim. The data that you collected can help decipher these interwoven – and sometime contradictory- definitions of risk and vulnerability. 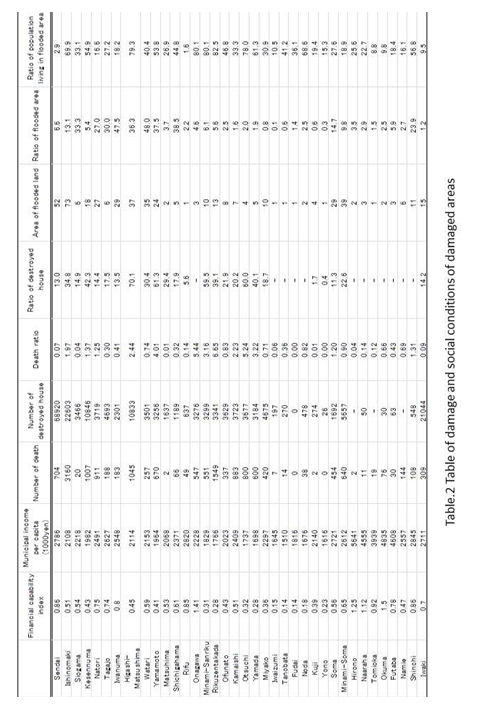 I understand that the data shows the negative correlation between damage and economic situations, but it is strange not to discuss about geographical characteristics when you analayze the damage caused by tsunami. 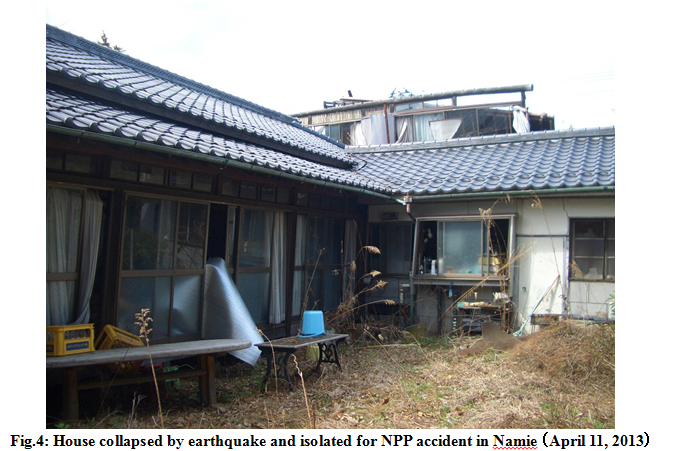 The social and physical vulnerabilities found after Great Hanshi-Awaji Earthquake was old wooden structure housing that does not follow 1981 new building code. But this might not be the case for 3.11 disaster. I think it might be interesting to conduct same analysis for other disaster in order to examine the similarities and differnce in terms of corelation between damage and causes for that. I was really impressed with the amount of data that this paper dealt with! As others have already pointed out, I wonder how you consider the relationships among different types of gap. Each of them, I think, are very important that they even merit to be individual papers. I was particularly fascinated by your analysis on information gap taken up by the media. I’d be interested in knowing more about the methodology you’ve used (and the software used). Your finding that newspapers continued to take up 3.11 more actively than blogs and Twitter is very interesting and inspiring. Thank you very much for sharing this insightful paper! As you have shown, it is really important to pay attention to multiple gaps resulting from the disaster. I am particularly intrigued by your distinction between “gap of information environment” and “gap of information which is focused and taken up by and in media,” which helps illustrate the fundamental complexities of information ecology in the stricken area following the disaster. Like Laura, I am wondering if you are interested in the role of the affected people with the different levels of media literary in affecting post-disaster information gap. I am also curious as to how you think about the reproduction of tweets (a.k.a “re-tweets”) in your analysis. Again, it’s really a great paper, and greatly looking forward to our discussions at the workshop! Hi Ryuma, very important work indeed! You raise questions regarding inequalities due to age and place of habitat that are extremely important. Regarding the media coverage of the disaster, the pictures you chose illustrate very well the “confusion of topics and agendas” as you put it very well. The authors analyze 186,000 twitter posts to identify gaps in information usage and the shifting topics of attention regarding the disaster reported in social media. This is a very interesting paper, and deserves a more detailed analysis. Recognition of the use of social media by different groups in the population provides a very useful profile of the capacity of these groups to take action and guidance to public, nonprofit, and private organizations regarding needs that could be met to enable more self organizing and effective collective action. Nice work! I am 2nd respondent for your manuscript. The following is my comments for it. I will speak this in oral today, but leave is also as a text here. I think it important to acknowledge that the gap of information and interst forms the gap of assitance which would be important human and knowledge (experience) resources, knowledge ,human and financial resources,for promoting local recovery planning. One of the difficulities for Tohoku region in order to work on recovery process is that they lack outside assitance by experts and consultant to prepare community-based recovery plan. Of course, local government are trying to involve local residents in the process of developing community-based recovery plan,however,the shortage of local government officials made this difficult. 2. Obeservational-approach or Action-oriented Research? In general, I agree that it is important to clarify the relationship between social vurnerability and reponse/recovery for disaster studies. The recovery process and mechanism is not as same as every disaster, because social culture, vurnerability and polical condition are quite different. That is why important to examine vunerability. However, my question is that is it good or ideal attitude,especially for Japanese experts, just observing this relationship? I think the action-oriented reseach is more important for disaster recovery studies along with ongoing process of recovery in the real world. If we find the mechanism and factor that is obstacle for recovery process, we should make some action with local stakeholders to solve it, then, evaluate and analyze whether the action worked well or not. It is difficult for international scholars to act this way, but I think Japanese has to provide enough English written information so that they could understand the situation in Japan, then, could give us quick recommendation for us. I guess that Nuclear issues are more written by Japanese and international media, but not tsunami-devasted area( except Fukushima prefecture). The quick response, action and evaluation circulation is needed for post-disaster recovery planning. This may work to correction of assitance gap, which I stated above.